Michael Hudson has a new book out so I thought it was high time I posted some thoughts I’ve been meaning to write up about his last one, The Bubble and Beyond. 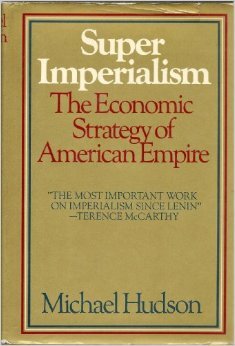 I’ve posted before about Hudson’s 1973 classic Superimperialism, whose analysis of the economic strategy of American Empire was followed by a terrific 1977 sequel called Global Fracture that analyzed how the US defeated the challenge to that strategy that was mounted by the New International Economic Order in the early 1970’s. Then came a long gap: his next book didn’t come out until 1992. Folks like Vijay Prashad refer to these two early books as “classic accounts” of 20th century economic history, and they’re on my list of favorite books of any kind. Much like Thomas Pynchon, I can’t say that his post comeback work that I’ve read is as great as his early stuff, but then again I’m a recovering record collector so that’s a default position I take from time to time. The Bubble and Beyond mostly concerns itself with economic theory which is a bit of a drier read than the detailed political history laid out by Global Fracture & Superimperialism. What The Bubble and Beyond does have is an appeal that any record collector can understand: it raises the question, “Why isn’t this guy more famous?” Much like underground records that are too thorny to cross over, Hudson’s work is not an easy read. He is eclipsed in mainstream liberal press outlets by more widely read authors like Paul Krugman and Joseph Stiglitz that are more accessible. Some of this is down to the main criticism I have of The Bubble & Beyond, which is that it is too repetitive. I thought of a 4th grade classmate of mine who responded to my repetitive report on beavers with the comment, “I didn’t know beavers do everything twice.” A better editing job could have made it much shorter and therefore more likely to be read. But some of his absence from mainstream media is down to the fact that his critique of economic policy is more radical than that of Krugman or Stiglitz, even though they share common concerns. On positions where Hudson and Krugman now agree, Hudson has been consistent over his career, while Krugman is a former proponent of free trade policies who changed sides without public explanation. Stiglitz served under Bill Clinton and was one of the architects of the Third Way that became the doctrine of New Labour and New Democrats in the ’90’s, even though he battled Larry Summers from a relatively progressive position within that ruling junta. Hudson publishes his non-academic audiences through Counterpunch, while Krugman is an Op Ed columnist for The New York Times and Stiglitz is a columnist for The Guardian. Krugman and Stiglitz are on the faculties of Princeton and Columbia, while Hudson teaches at the University of Missouri, Kansas City. I heard about Stiglitz and Krugman’s work from The New York Times, while I was first introduced to Hudson’s work when I read an interview with him published by Black Agenda Report. Hudson’s persona is not that of a fiery radical like Alexander Cockburn, however. He doesn’t even come off as a rational radical like Noam Chomsky. There is no signifier of the counterculture about him. He could be published by the Times and appear on PBS instead of The Real News Network without posing any threat to the expected image and mannerisms of white guys in suits with glasses projecting a “dignified” gravitas. He quotes Marx and Lenin much more than Krugman or Stiglitz, but he places them in a Western tradition of economic theory that takes as its goal the not very controversial idea that the goal of politics and economics should be to raise the standard of living for the members of a society. Marx’s writings come off very differently when they are presented as one voice in a highly contentious but nevertheless cohesive tradition of thinking about how to accomplish this goal. Hudson debunks the idea that capitalism is a “free” market system whose forces operate on their own to shape history. He shows that major western industrial powers achieved their wealth through their own kind of central planning, even though it differed in important ways from the self-named Planned Economies of the Socialist block. He maintains that even the current neoliberal era is a planned economy, only its planners reside on Wall Street instead of behind the reins of former industrial titans like Ford Motor Co. and US Steel. 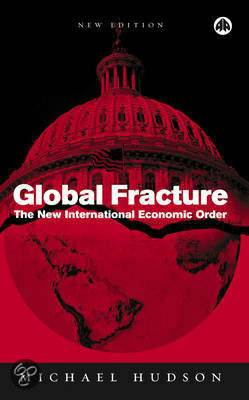 The failure of the Washington Consensus to address poverty in the Global South results largely in his view from the deliberate steps the World Bank and the IMF took to prevent nations of the Third World from planning their economies with the strategic protections that countries like the US used to gain the wealth they are now addicted to gambling away. This resonates for me with my own experience with the academic world. I grew up in Cambridge, MA in the shadow of Harvard University. My parents taught the children of Harvard and MIT faculty members at private elementary and high schools I attended as a scholarship student. I learned to play drums by playing in a band with a bass player whose father was on the faculty of the Sloan School of Business at MIT and whose guitar player was dean of Harvard Business School. Stories I heard around the dinner table included gossip about another Harvard Business School professor whose BMW malfunctioned and drove forward when it was put in reverse, causing him to drive through the wall of his garage. The political slant of both my elementary and high schools was liberal and countercultural, respectively, but I absorbed clear messages about where the real money behind them came from. I went on to attend Brown University and circulate in a left wing academic culture that was almost entirely segregated into departments whose explicit focus was on literature and culture – Comparative Literature, English, Modern Culture & Media, French, etc. I knew fellow students who were active with the International Socialist Organization and went on to do left wing work in documentary film, academia, and publishing. None of them to my knowledge ever took a course in economics, even though we talked about economics all the time in our classes. When I wrote a thesis on money in literature, my thesis advisor only suggested one actual book by an economist to read for my research, which was Capital by Marx. Even when I took a course as a junior with an academic who focused more directly on the study of money his own work, (Jean-Joseph Goux,) the frame of reference was primarily philosophy and psychology rather than economics. Hudson’s book made me realize the presence of a limitation in my own education I hadn’t even thought about at the time. The segregation of left wing thought about class and economics to literature and the “humanities” – as if economics is not about humanity – was a sign of defeat. It was only after I graduated from college that I came around to reading actual economics, and it took many years before I found writers like Hudson after reading Krugman in the ’90’s when he was a free trade cheerleader. I read a blog post by Jedediah Purdy last year that argued that economics departments have always been well aware of this barrier. He wrote that he received the following message from economics professors at Harvard that taught him as an undergraduate: You can have your feminist, anti-racist, anti-homophobia, and class conflict studies in your humanities courses, as long as you leave them at the door when you come to this class. We’re here to study economics as a science, and those preoccupations with advocacy for disempowered peoples have no place here. They had no expectation that this stipulation would be challenged, and it wasn’t. This in turn contributed to Jedediah’s view that Harvard was and is a corrupt institution. Harvard and other Ivies such as Yale, Princeton, and Columbia are of course where people like Barack Obama, Larry Summers, Bill & Hillary Clinton, George Bush, Henry Kissinger, Paul Volcker, Ben Bernanke, yada yada yada are educated, or some might say, indoctrinated, on their way to being stamped with the seal of approval of the Republican or Democratic National Committees. Hudson argues that financial institutions that endow these Universities have ensured that they will reproduce the ideology that allows for their current position of dominance in Washington and New York’s corridors of power. This ideology has been upheld by both parties from the beginning, witness the fact that Jimmy Carter kicked off the neoliberal era once known as “Reaganomics” by appointing Paul Volcker to head the Fed in 1979, and more recently, Obama’s decision to hire Larry Summers after his first election. As a microcosm of bipartisan support for this status quo, consider the following story: while teaching at a private school outside Boston, I recommended William Greider’s Secrets of the Temple to the Head of the school because it had motivated me to become a better math teacher after it showed me how much students will need to be able to understand economics in order to understand politics in today’s society. As I discussed Paul Volcker’s central role in the story the book tells, she told me that Volcker’s granddaughter was a student at our school. She also said she was trying to have him come and give a talk there, presumably as a fund raising event. When I asked her, “Can I heckle him if does speak here?” she said, “No, and I’m glad you asked.” Her response can not be chalked up to Republicanism – she was a staunch enough Democrat to have once told me that she would have moved to Canada if Romney had defeated Obama. (Some students at the school wore Bain Capital backpacks, and one of Romney’s chief advisers sent his children there.) Yet she referred in a seminar on teaching math to what Harvard Business School professors told her they want their future students to be able to do, without critically examining whether preparing students to be fed into that system of training was a good thing for society. 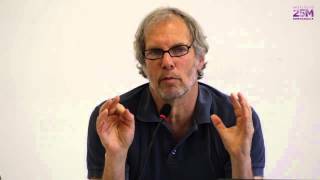 has the Political Economy Research Institute, whose scholars like Bob Pollin are also regular guests on TRN. While they may be outside of the halls of power in Washington, it’s been surprising to me to see learn that many of these scholars have served as advisers to governments and political parties in places like Ecuador, Iceland, Greece, Mexico, Korea and Spain. I’d like to think they’d be called to serve if Bernie Sanders were elected, but so far he’s name checked Krugman and Stiglitz instead. The lengths to which the ECB went to crush Syriza after they brought economists with a similar academic background such as Yanis Varoufakis into their cabinet shows that today’s anti-industrial finance capitalists are well aware of the danger that would pose to their current position of power. 13 Sep	This entry was published on September 13, 2015 at 6:51 pm. It’s filed under Anti-Neoliberalism, Book Reviews, Corporate Welfare, Current Events, Debt, Economics, History, Politics and tagged american empire, Bill Black, Black Agenda Report, Bob Pollin, Book Reviews, Brown University, Cambridge, Capitalism, Cold War, corporate welfare, Counterpunch, Economics, Global Fracture, Harvard University, History, Imperialism, Jedediah Purdy, Joseph Stiglitz, Karl Marx, michael hudson, Mission of Burma, MIT, Nick Drake, Paul Krugman, Paul Volcker, Superimperialism, Syriza, Television Personalities, The Bubble & Beyond, The Fall, The Last Poets, The New York Times, The Real News Network, UMKC, Vijay Prashad, Washington Consensus, Yanis Varoufakis. Bookmark the permalink. Follow any comments here with the RSS feed for this post. You amaze me, dear man. —- love ya, E.